The snowy owl has stereoscopic vision; although, it cannot move its eyes. To compensate for this, the owl has the ability to turn its head two hundred and seventy degrees. I would imagine that the first owl to have tried this out was a very brave one indeed. I watched a hippopotamus try the same thing once and his head fell off. 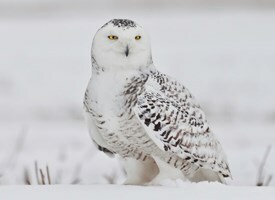 Snowy owls can see equally well in the day and night. They are, however, quite far-sighted. How ironic that the “wise old owl” could not even see the text of a book…unless that book were being held quite far away, of course. But, who would turn the pages? Nobody, that’s who! B. scandiacus is both diurnal and nocturnal. This is unusual among owls, although I doubt that it is due to malice. 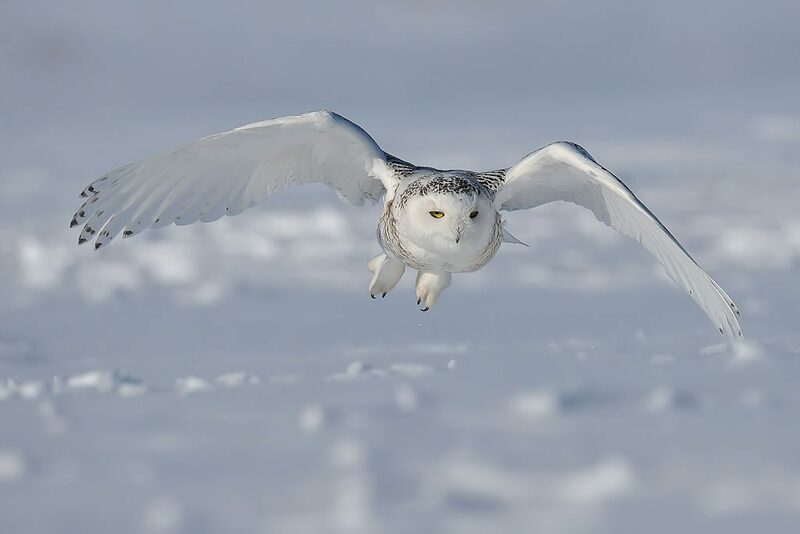 If the snowy owl were nocturnal, when those arctic twenty-four hour days rolled around, the bird would have no choice but to hunt during the day, starve or take up photosynthesis. And, it is not as if hunting is going to take a lot out of the bird. It simply perches and waits for something to stroll by. If it moves and isn’t a polar bear, it is food. The snowy owl is not monogamous. Odds are that a few of the raptors might inadvertently take the same mate several years in a row; however, these meetings are quite awkward as they seldom remember each other’s names. Five to eight eggs are laid in a nest that is usually on the ground or a rocky outcropping. Incubation takes about a month, after which the males provide lemming-strips for the young until the female can leave them alone in the nest; then, feeding the chicks becomes a joint effort. About half the young survive. The rest are staked to keep them from becoming vampires. Because B. scandiacus is not endangered in the least, it is protected in the U.K. and most of the United States; however, in the part of the United States where they might actually BE, Alaska, there is no kill limit on the birds…provided you eat or wear them. There is evidence that some are being killed just for their feet and eyes which are highly prized in parts of Asia for some reason. I would assume that the feet and eyes are less prized by the Asians than they were by the snowy owl from whom they were taken from, but what do I know?